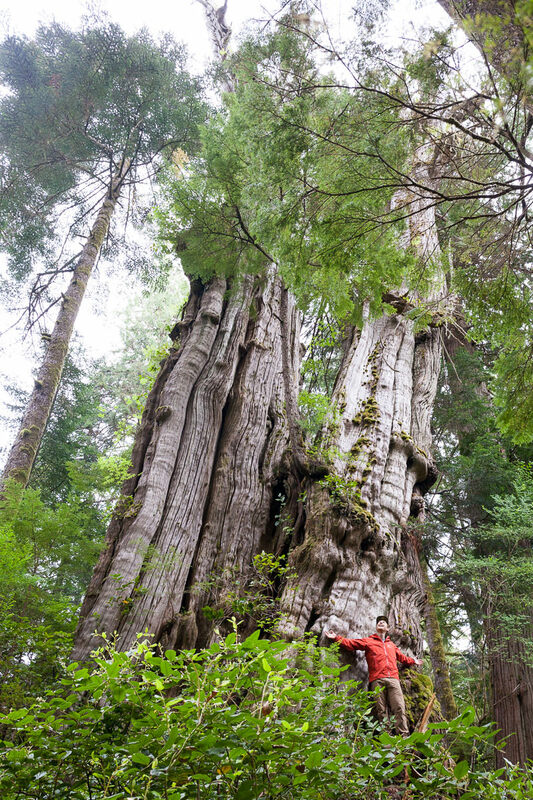 Vancouver Island is home to trees of magnificent proportions including Canada’s largest tree, the Cheewhat Giant. 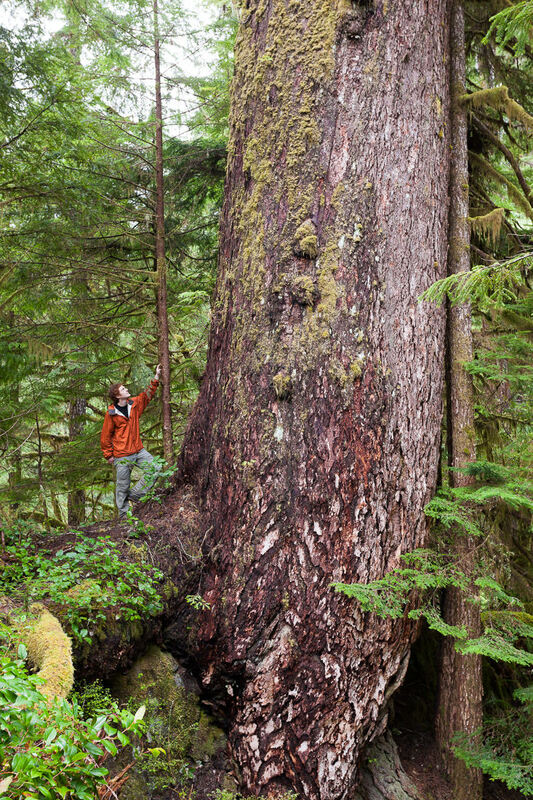 Some, such as the Red Creek Fir near Port Renfrew, are the largest of their species in the world! 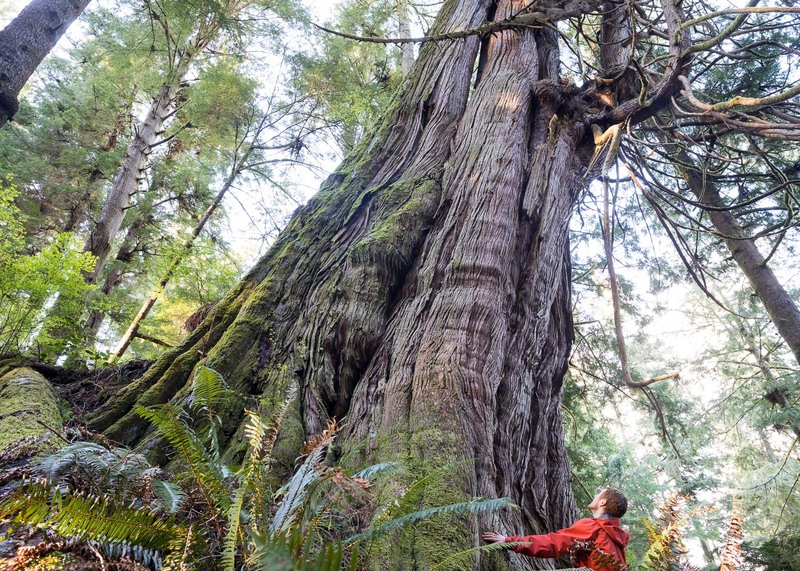 Growing as tall as skyscrapers and as wide as living rooms, these ancient trees can live for thousands of years and inspire wonder and awe in people around the globe. 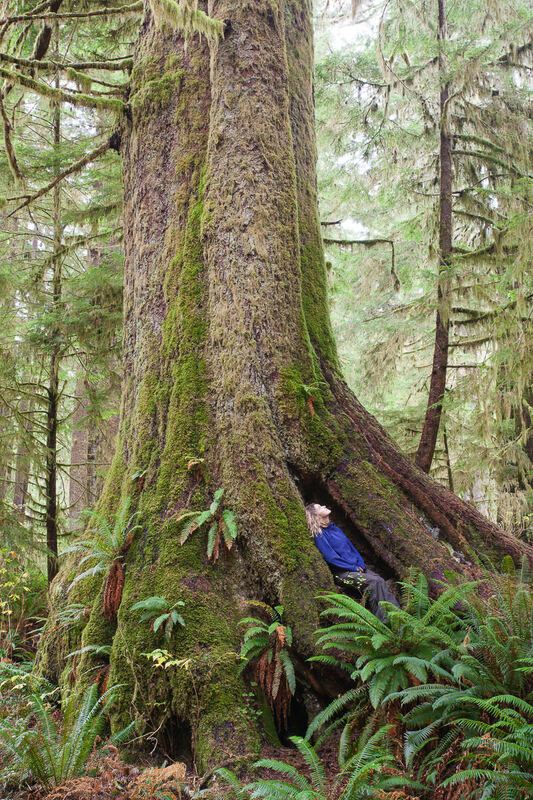 Please SPEAK UP to protect BC’s old-growth forests and forestry jobs at www.BCForestMovement.com Photos by TJ Watt. 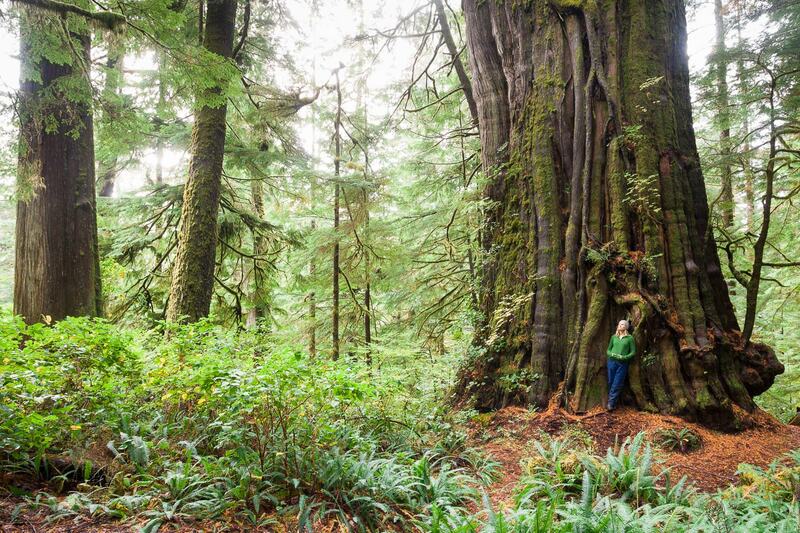 Along the path leading to the Red Creek Fir you will find this amazing group of ancient redcedars, aptly nicknamed " The 3 Guardians"
The Harris Creek Spruce, which grows alongside the road from Lake Cowichan to Port Renfrew. 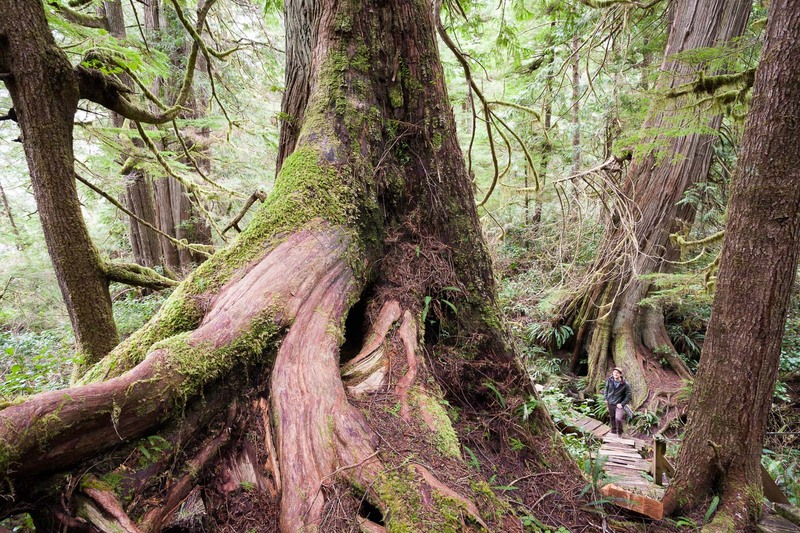 Easily accessible by a short path. Watch for small sign while driving the Circle Route. 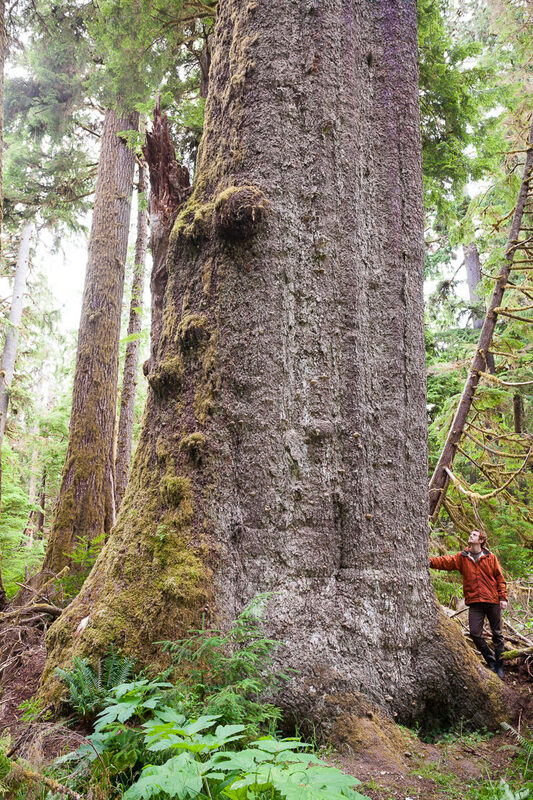 The Yakoun Spruce on Haida Gwaii. 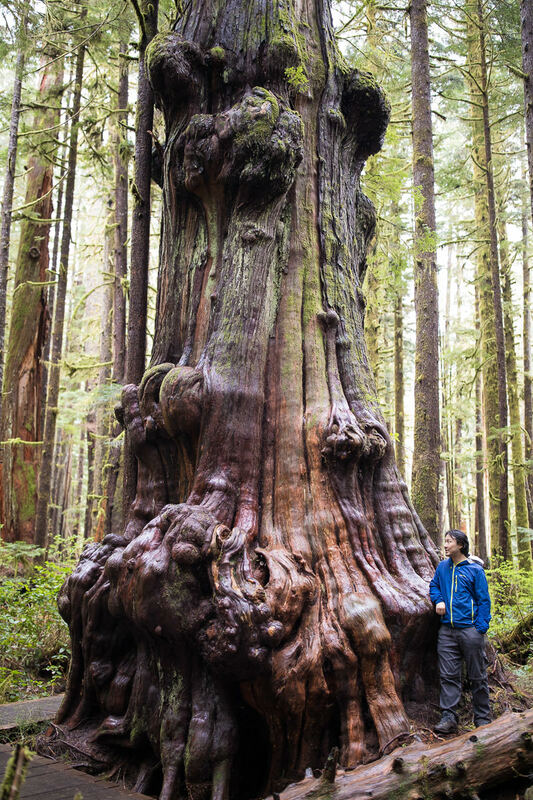 The 'Gnarly Tree' at Avatar Grove in Port Renfrew. 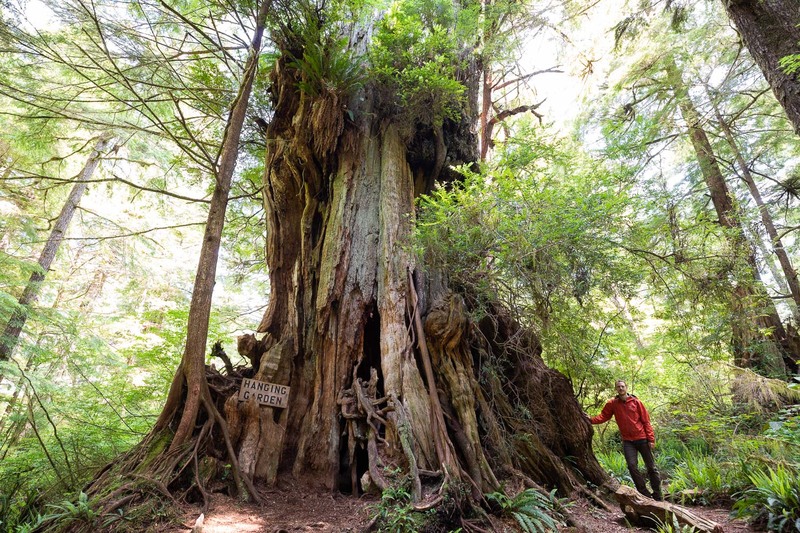 This western redcedar has one of the strangest burls we've ever seen! 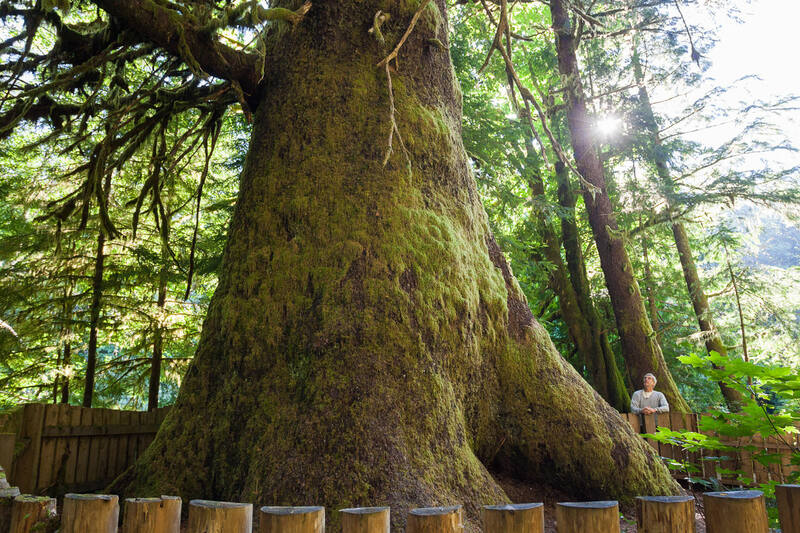 The incredibly burly cedar in the lower Avatar Grove. 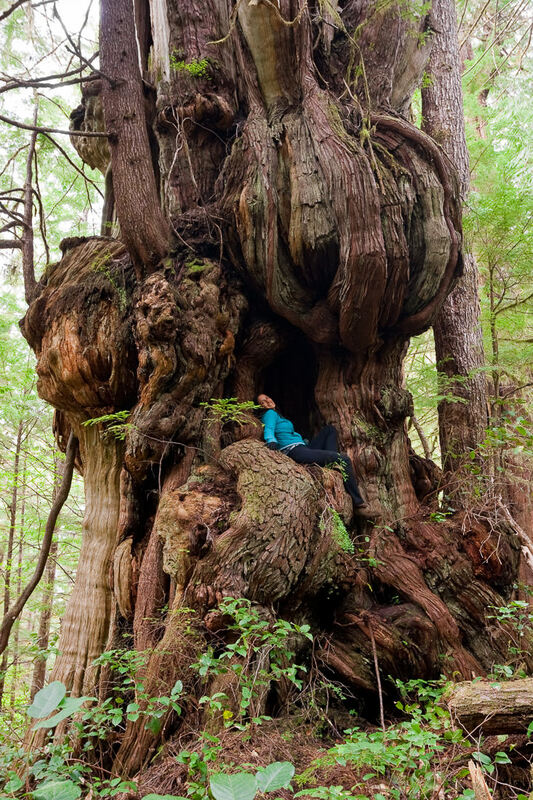 This has to be one of the coolest trees on Earth! 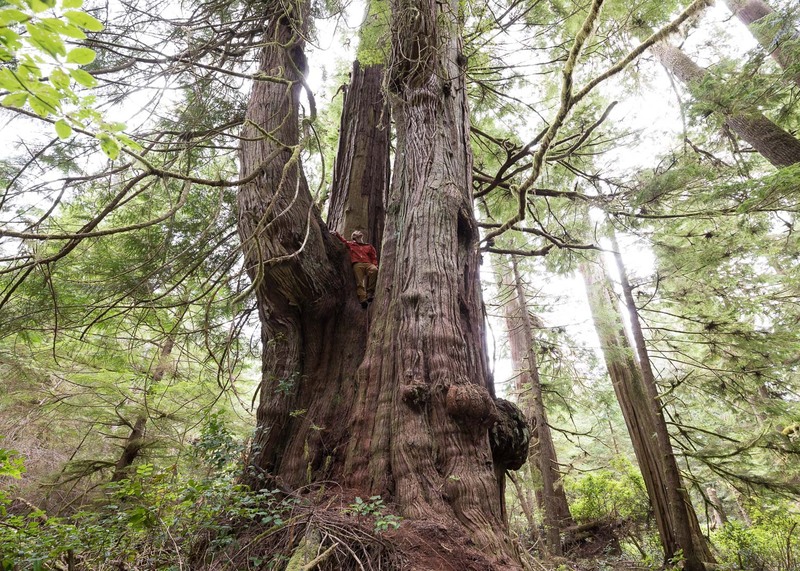 This crazy looking redcedar with its spiky candelabra top grows in a remote location on Flores Island north of Tofino, BC. 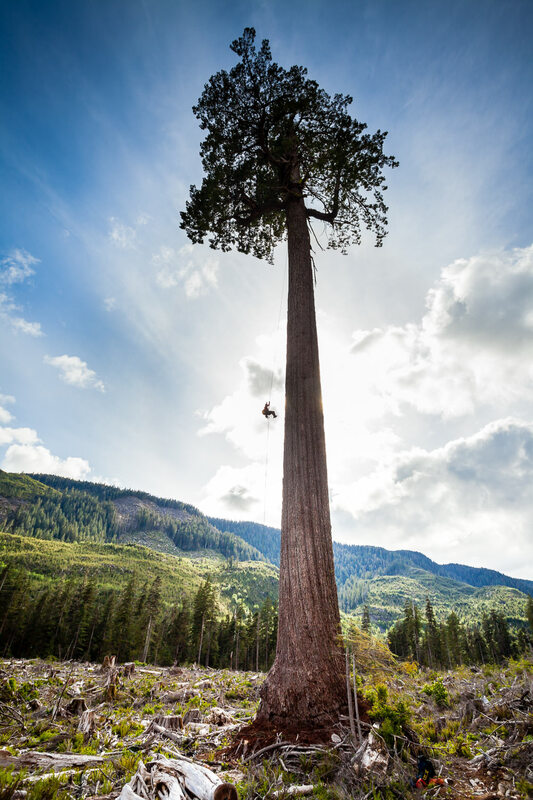 One of the most phenomenal trees on this planet! 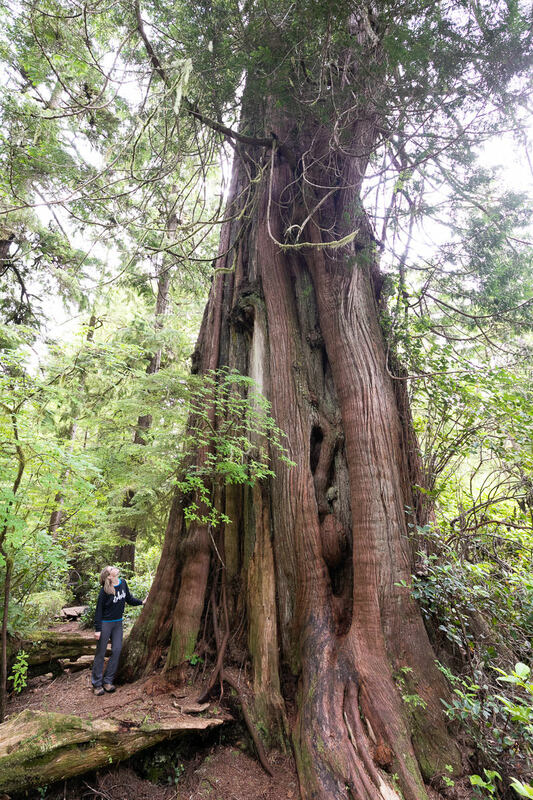 This bulbous redcedar grows along the trail to the Cheewhat Giant (Canada's largest tree) in the Pacific Rim National Park on Vancouver Island. 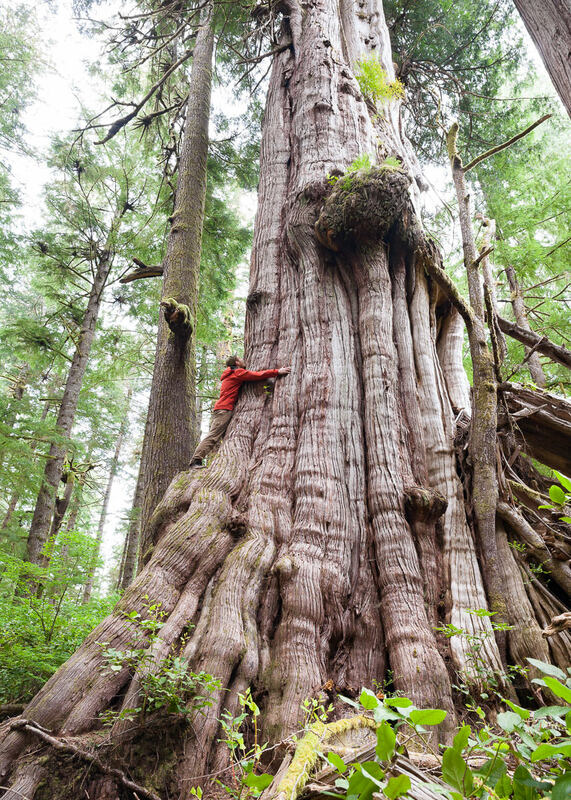 TJ doing his best to hug the country's 4th largest redcedar, located just before the Cheewhat Giant (Canada's largest tree) in the Pacific Rim National Park Reserve. 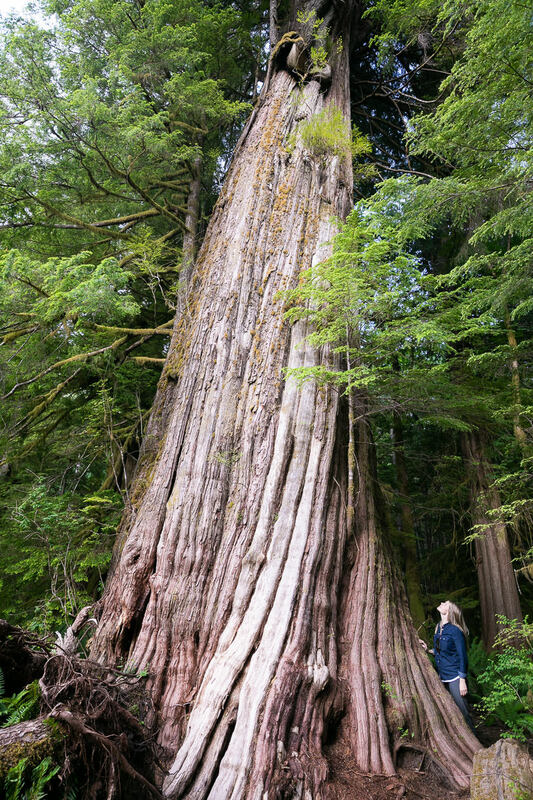 Canada's 3rd largest western redcedar growing at the north end of Cheewhat Lake. 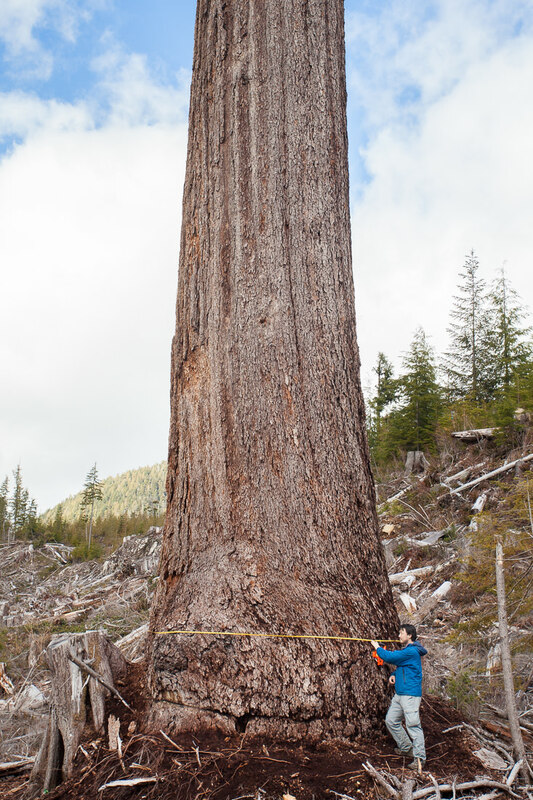 Height: 123 ft (37.5 m) Diameter: 19.5 ft (5.9 m). 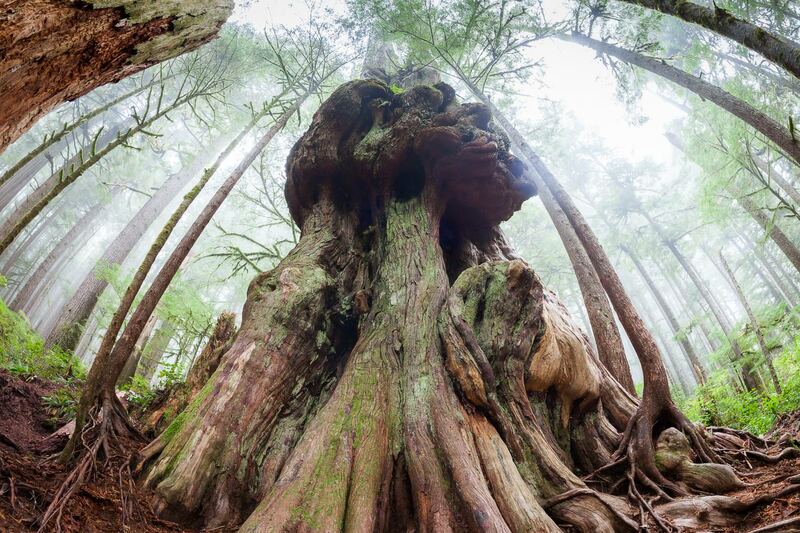 The Castle Giant is a monumental redcedar growing in the unprotected Walbran Valley on Vancouver Island. 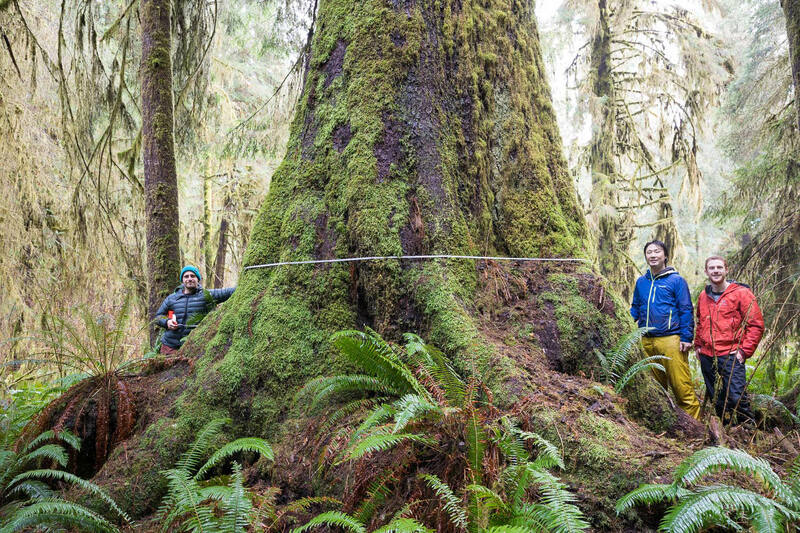 This redcedar measures over 16 ft wide at the base and was used by scientists for canopy research projects. 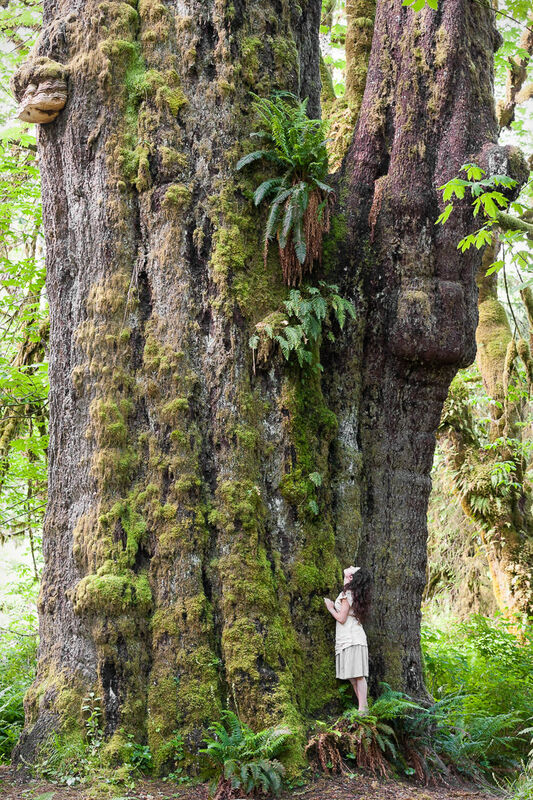 The Emerald Giant (or 'Mordor Tree') in the Walbran Valley. 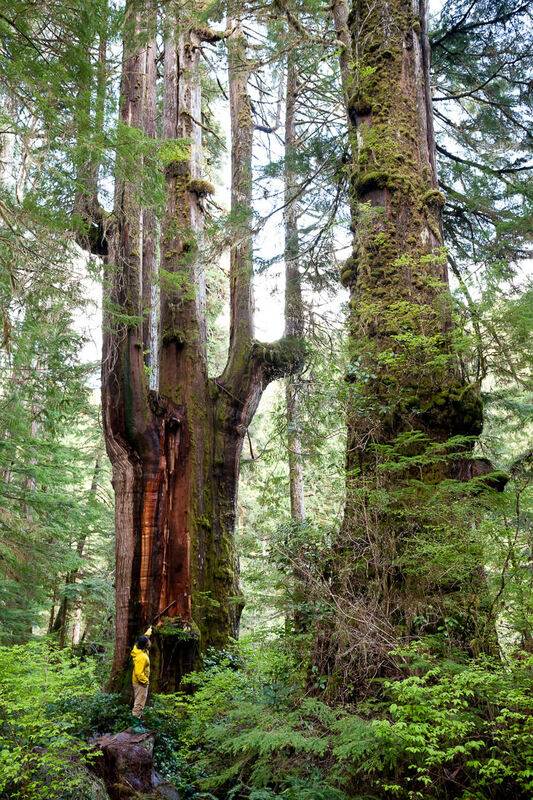 This tree shows a great example of the candelabra top that develops in these very old redcedars. 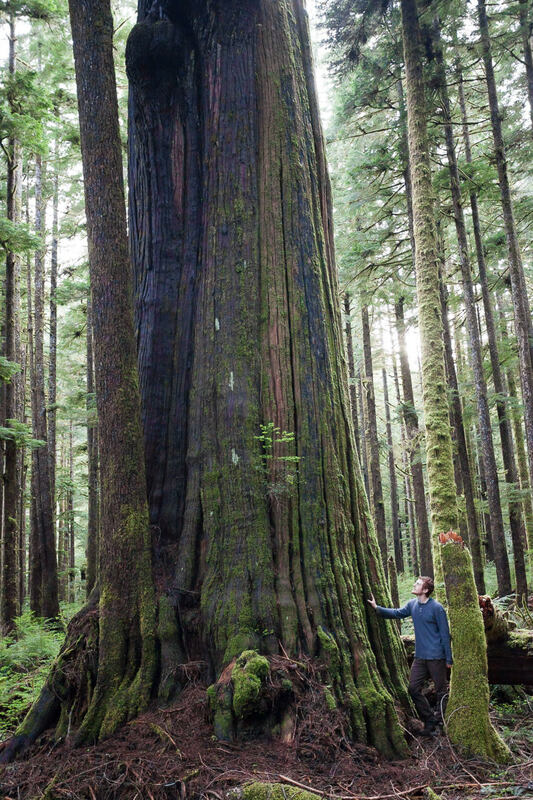 The Alberni Giant, Canada's 5th widest known Douglas-fir tree. 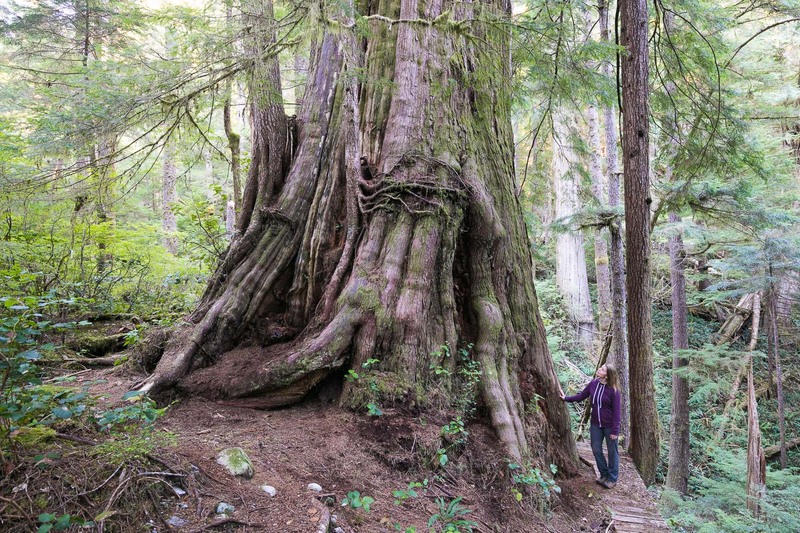 This tree grows in the Nahmint Valley near Port Alberni. 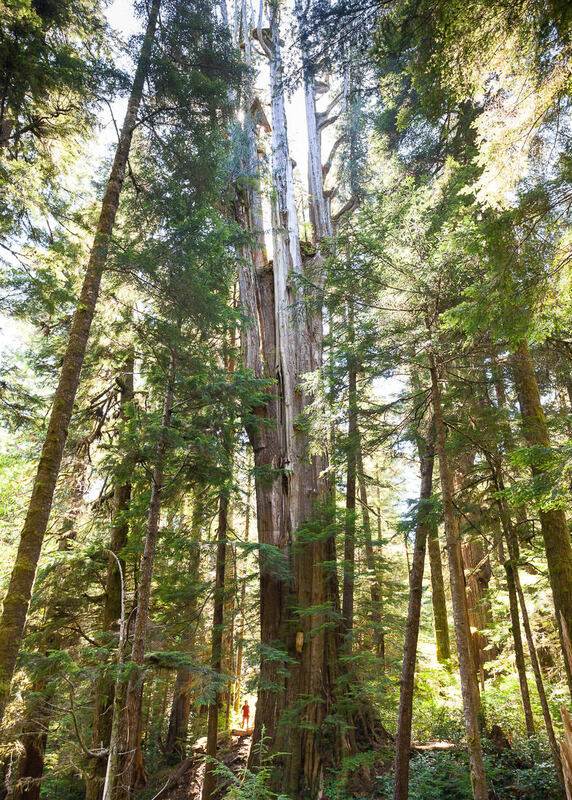 Sadly, a recently clearcut came to within 10-20 m of the tree. 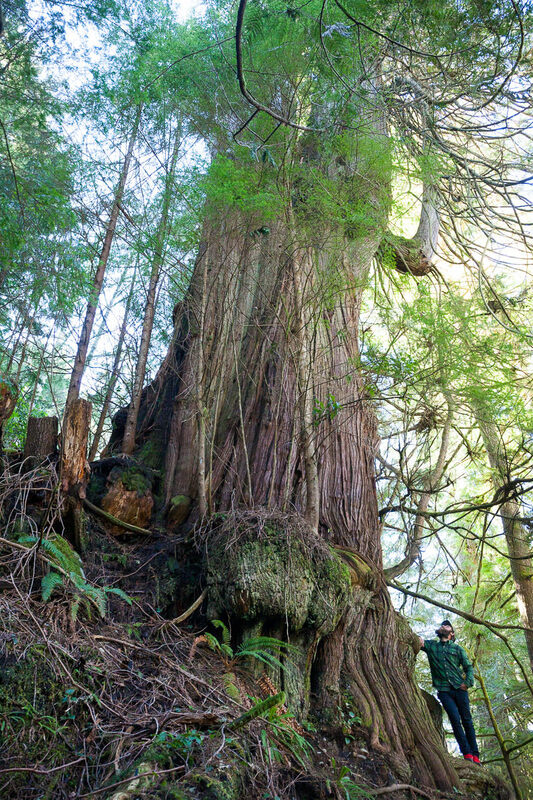 A MASSIVE western redcedar growing on Meares Island in Clayoquot Sound. 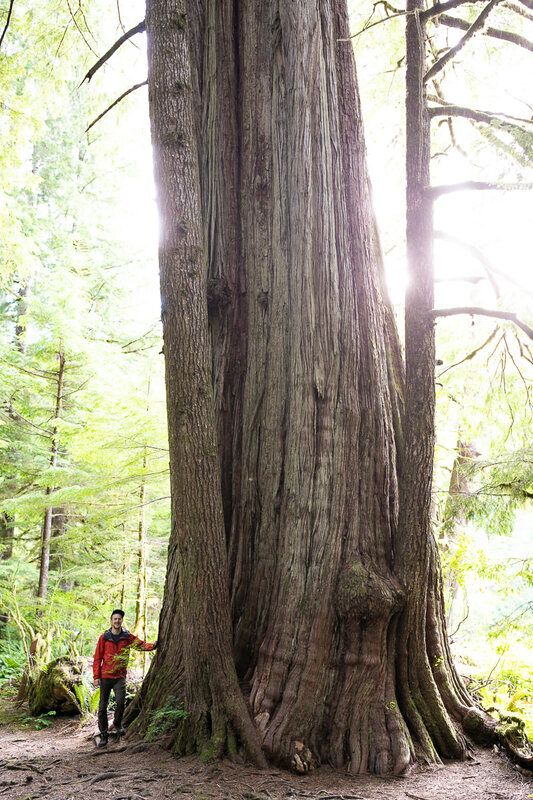 The backside of a cedar known as the 'Poster Tree' along the Meares Island Big Tree Trail. 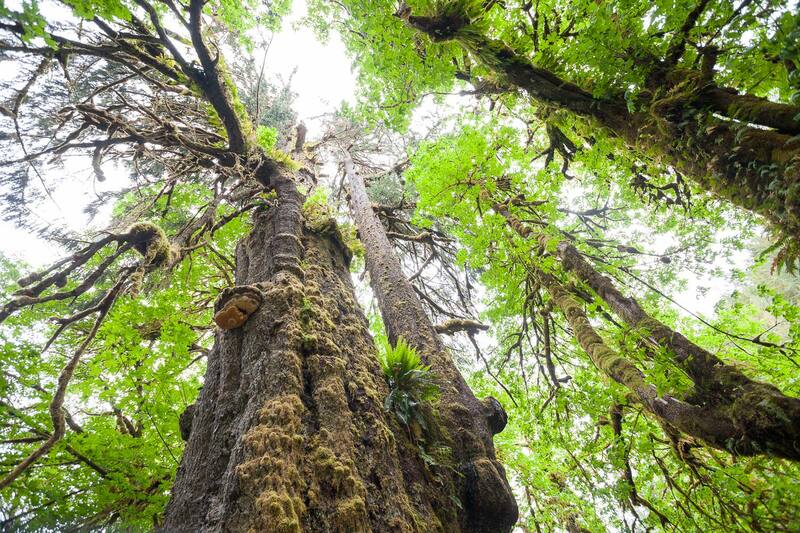 The Hanging Garden Tree. 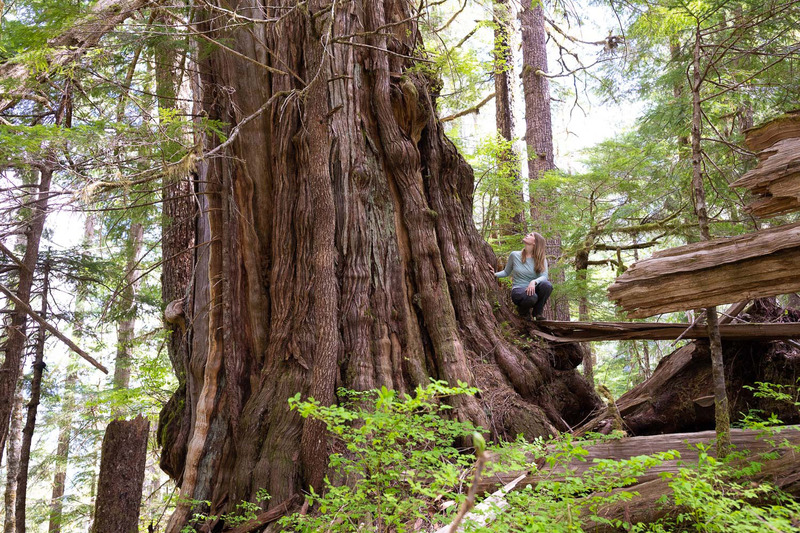 This ancient redcedar on Meares Island off the coast of Tofino, BC might appear at first glance to be dead but it is actually still living. 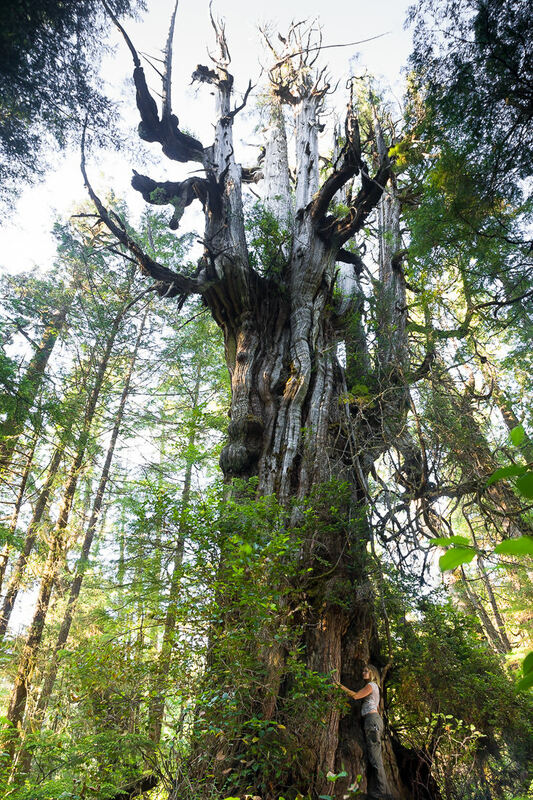 Its age would be hard to guess but it could have easily celebrated its 1000th birthday in recent times. 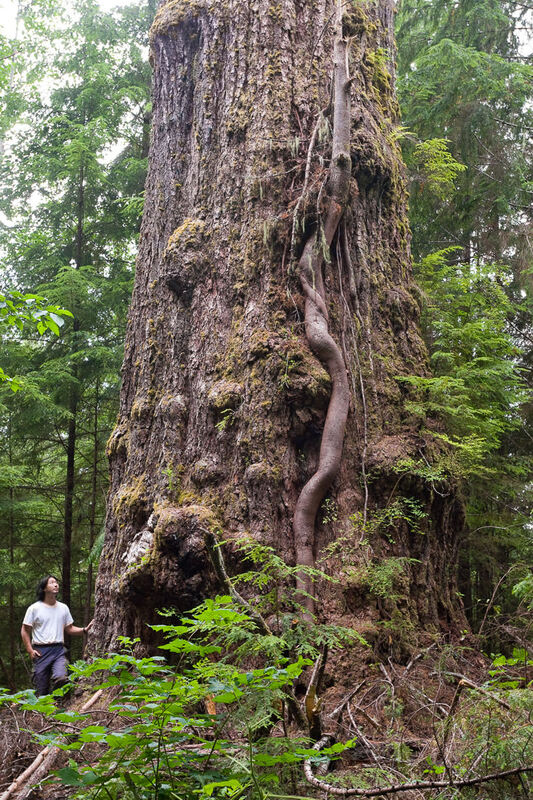 The tree lives up to its name with a whole host of plants and other trees growing from its trunk. 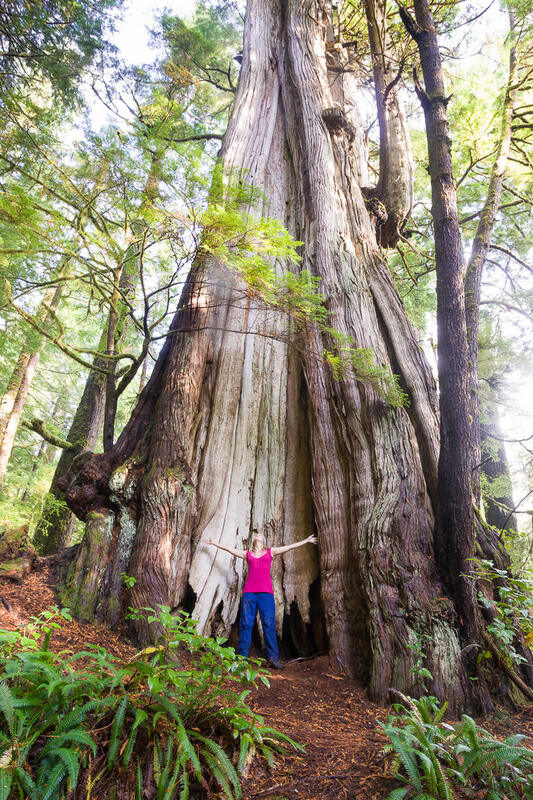 The unprotected 'Refugee Tree', the largest cedar in the Capital Regional District near Victoria, on Crown lands south of Sombrio Beach. 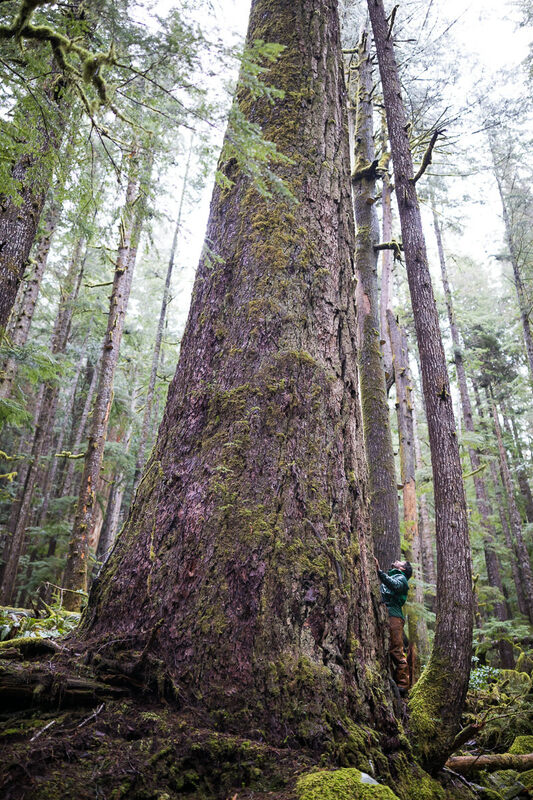 Diameter: 13.7 ft (4m) - would be much greater if on level ground! 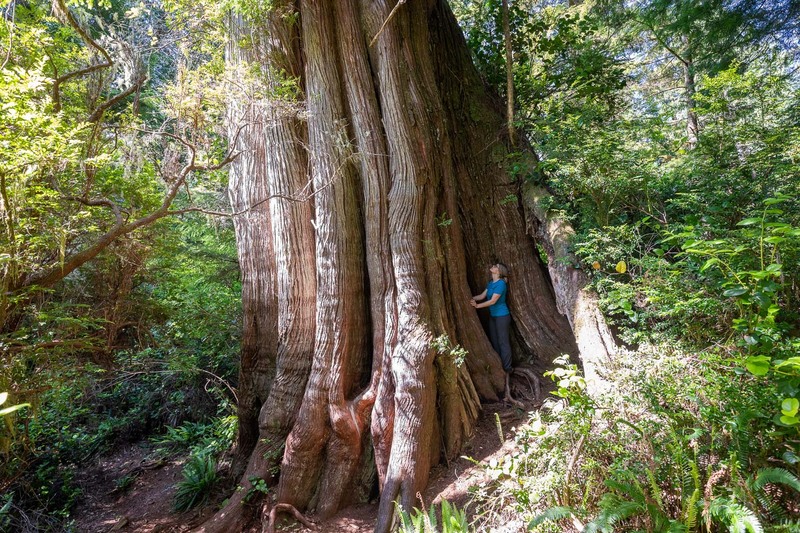 The 'Fortress Cedar' in the Jurassic Grove! 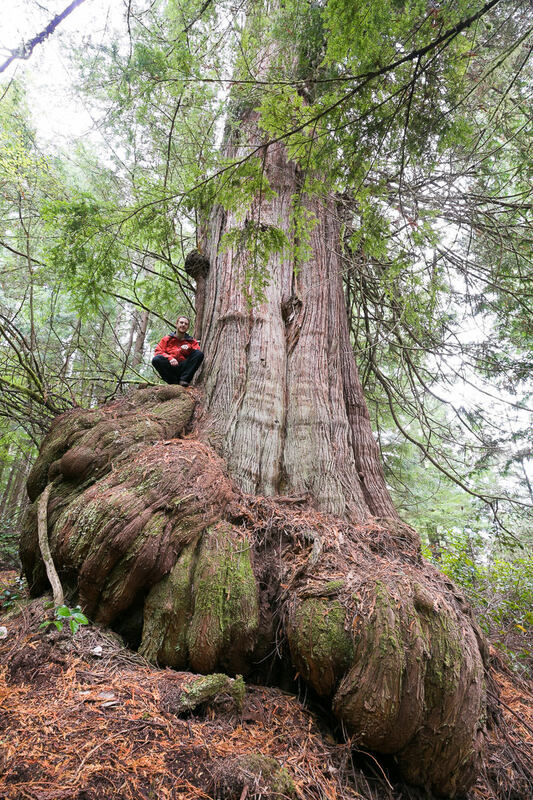 A super strange redcedar growing in Jurassic Grove that looks like a giant pumpkin! 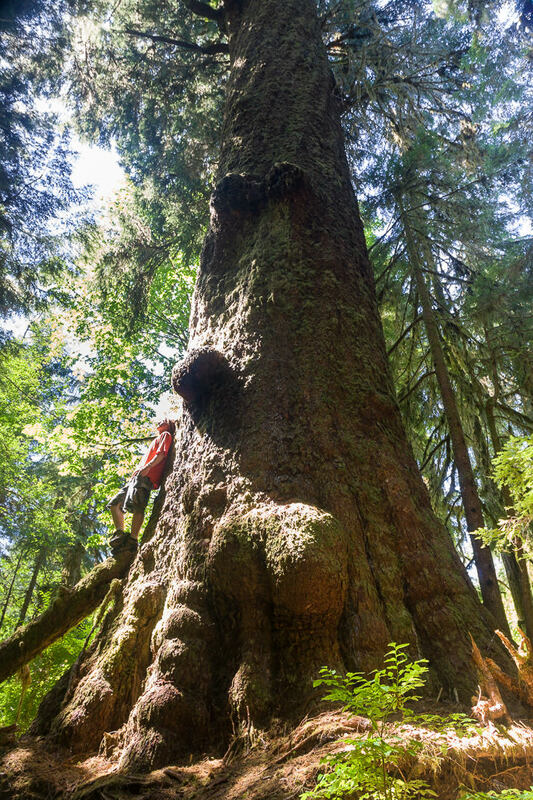 Alverez Fir - Upper Walbran Valley, Vancouver Island, BC. 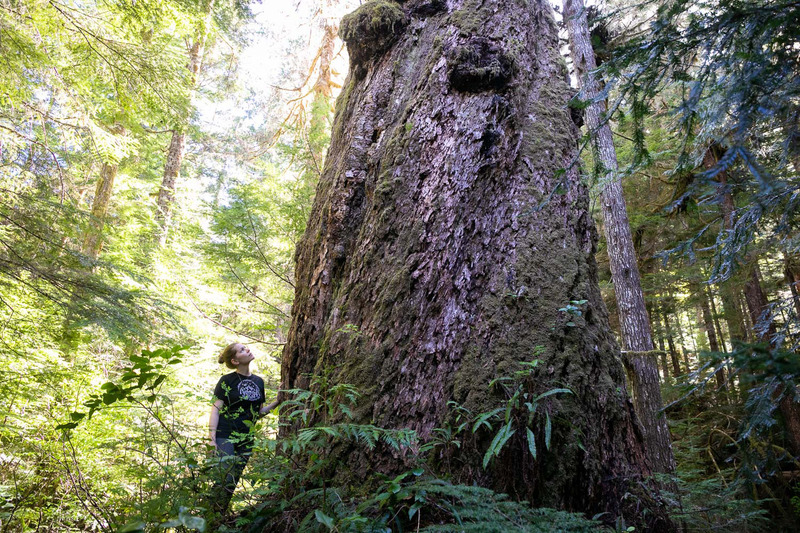 The Grandma Betty tree is gigantic Douglas-fir that was named after activist Betty Krawczyk who participated in some of the early blockades to try and protect the Upper Walbran Valley. 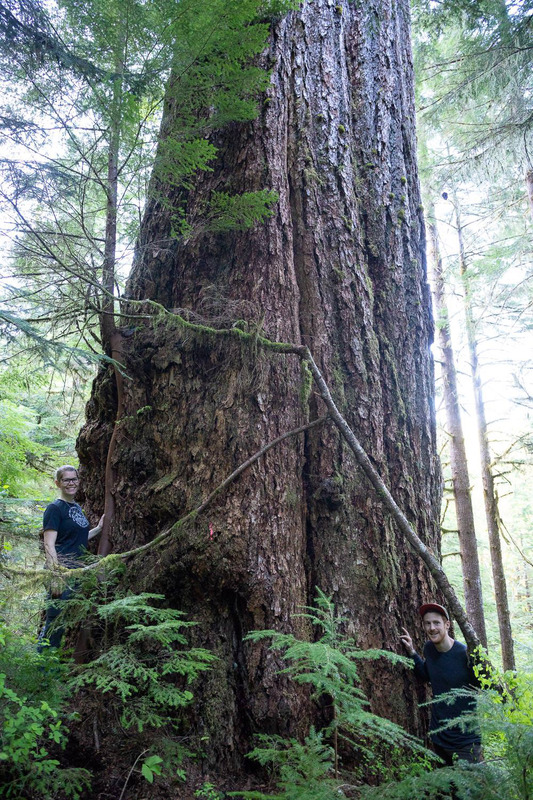 Sadly, the old-growth directly adjacent to this tree was logged in recent years. 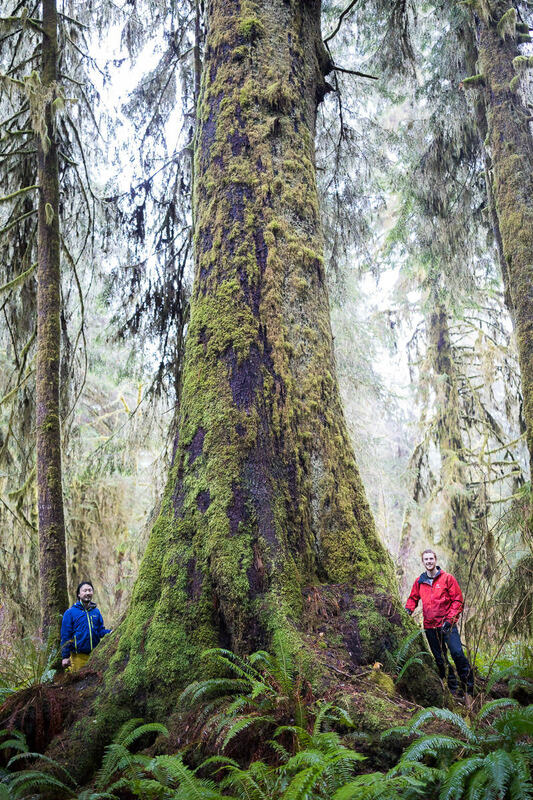 A sitka Spruce known as the Heaven Tree in Carmanah Valley Provincial Park. 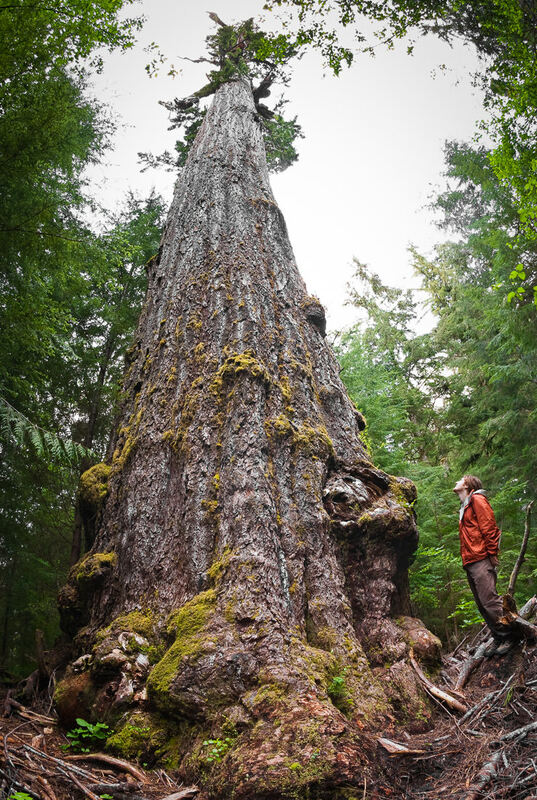 The incredible Canoe Creek Cedar! 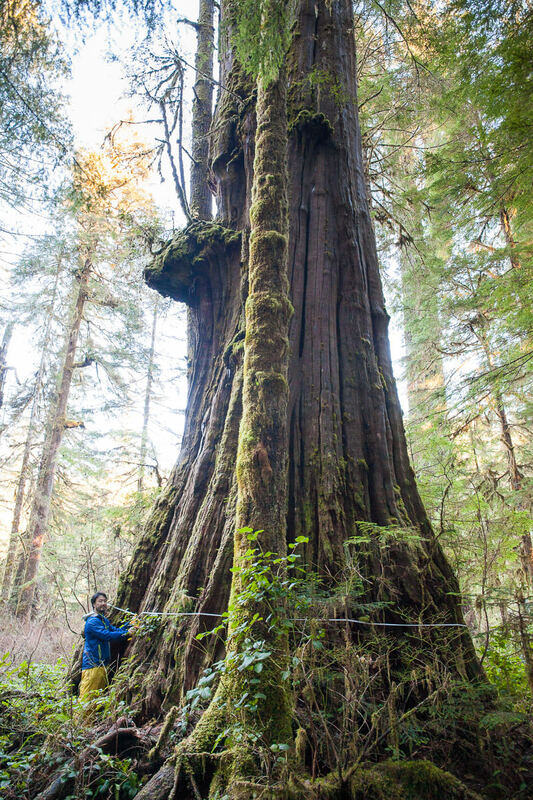 This tree grows along the Kennedy River and is accessed by a short trail off the highway between Port Alberni and Tofino. Not sure anyone has actually measured it yet but it's huge! 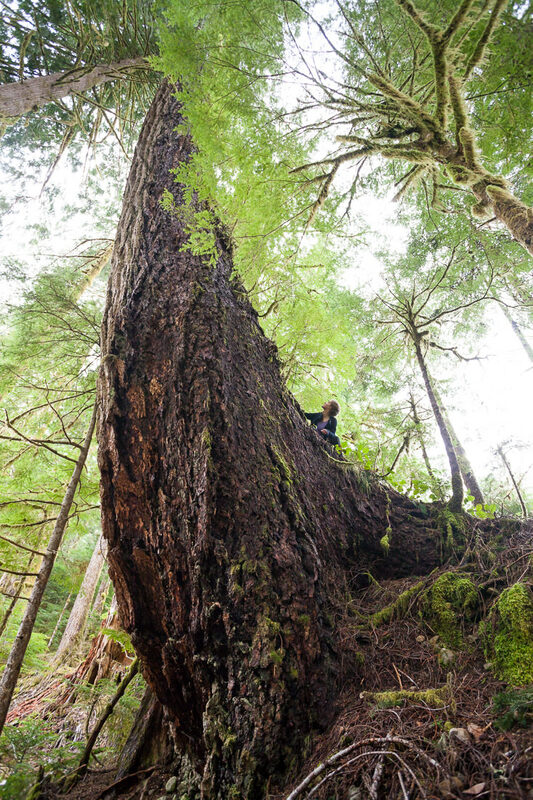 A massive Douglas-fir tree growing on Edinburgh Mt near Port Renfrew. 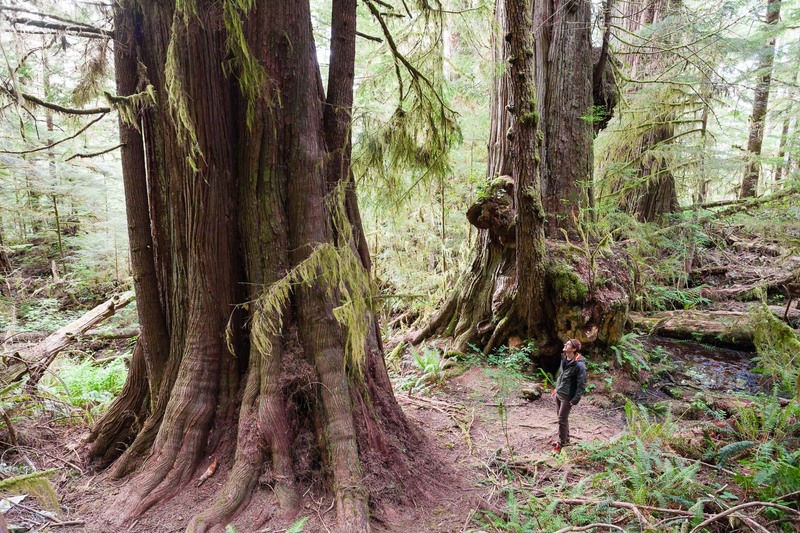 The largest redcedar growing in the endangered Eden Grove near Port Renfrew.